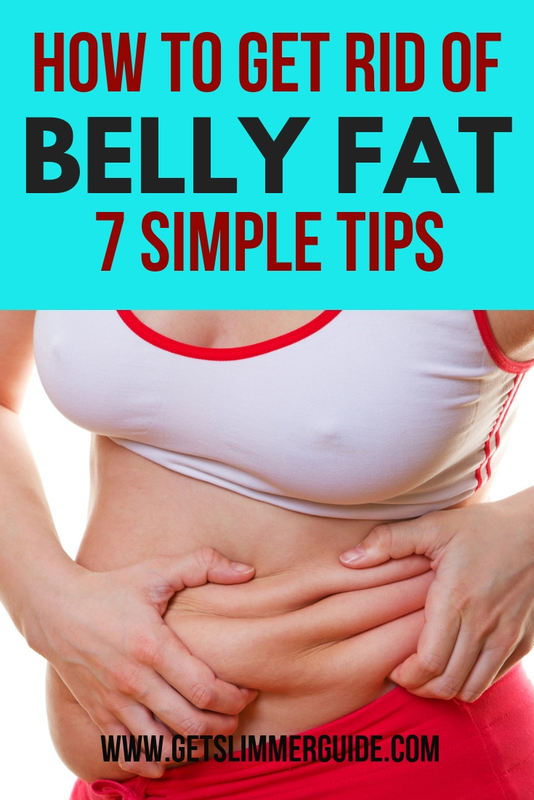 How to Get Rid of Belly Fat Fast - 7 Helpful Tips for Women! 7 Tips on How to Get Rid of Belly Fat Fast! I guess you are here because you are looking for how to get rid of belly fat fast. Belly fat needs to be addressed as soon as possible. It is not because of cosmetic reasons alone, we have to admit that a fat belly whether on a man or a woman is not an attractive thing to look at, but also because belly fat is not good for your health. When fat is deposited around your belly, it is also deposited around your vital organs causing diseases like diabetes, NAFLD, heart problems, etc. So if not for cosmetic reasons, one should try to reduce the bulge around the middle for health reasons. But, how do you reduce belly fat? Read on to find out. Belly fat responds well to exercises, especially aerobic exercises where you raise your heart rate. Exercises like, running, fast walking, jogging, swimming, skipping, elliptical trainer, bicycling, crunches etc. are most effective in reducing the belly fat. Exercising encourages your body to burn stored fat and build up lean body mass, that helps to raise your BMR forcing your body to burn more calories. Adding more protein to your diet is a good way of forcing your body to burn up the fat stored in your adipose tissue and help you get trimmer and leaner. A protein-rich diet can help you fight insulin resistance that causes fat to be stored around your middle and vital organs. Eating more protein has another advantage and that is, it controls your cravings for food and prevents you from snacking in-between meals. This is mainly because it takes longer for our body to digest proteins, it also has to work harder to digest protein, requiring more energy and burning stored fat. A study also demonstrated that eating more protein-rich diet, especially animal protein, prevented fat deposit around the middle. You could try protein supplements like whey protein to augment your intake of protein and reduce belly fat. Reduce sugar and starchy foods from your diet. You should work towards eliminating added sugar from your diet. It is hard for your liver to digest all the excess sugar you keep eating and drinking and just turns the excess sugar into fat to store in the adipose tissue and most of it ends up around your middle causing you to have belly fat (fat tummy). It also leads to insulin resistance, which is another factor that influences fat storage in your body. So cut back on the sugary food and drinks, do not add any sugar to your beverages and watch the inches melt from your belly. Carbohydrate intake is another culprit for belly fat. Several studies have shown that a reduction in carbohydrate intake helps to reduce weight. A low carbohydrate diet forces the body to use up fat stored in the most risky areas around the middle first. This reduces belly fat and the risk of several diseases as discussed above. This is more true of refined carbohydrates such as food made with refined flour, pasta, white bread, etc. When you reduce your intake of carbohydrates and increase your intake of protein, your appetite will go down and you will feel less hungry than before. This will, in turn, help you to drop some pounds and reduce the inches around your waist and get healthier. Adding more fiber to your food is one of the best ways to get rid of belly fat. More importantly, viscous fiber that binds with water to form a glutinous mass and takes a long time to digest, curbing your hunger pangs and forcing your body to work harder and burn more calories to digest it. Fiber also helps to slow down the passage of food through your digestive tract and inhibits the digestive process and absorption of nutrients. One very good dietary fiber is oats. Have a bowl of oats in the morning to reduce belly fat and flatten your tummy. You must be wondering what eating fats has to do with reducing belly fat. Well, it is good to have polyunsaturated fats such as are found in nuts, seeds and fish. It has been discovered in studies that polyunsaturated fats help to build up lean muscle mass as opposed to saturated fats. So include nuts and seeds in your diet. Though most people may not think so, sleep plays a very important role in controlling weight especially middle body fat. This may be due to the fact that lack of sleep causes stress levels to rise and trigger your body to start storing fat. So, to reduce stress, you need to sleep at least eight hours a day. This will help to reduce stress and help you get rid of your belly fat. Get into action now. Control that belly fat and reduce your chances of diabetes, heart problems, liver dysfunction and get back a trimmer and more beautiful body. Do you know of any other tips on how to get rid of belly fat? Feel free to add to the list using the comment form below. Thanks for Sharing your nice and informative words on belly fat. Above tips you have shared are really fabulous and helps to get rid of belly fat naturally. Informative article….. Happy to know that you found the tips on how to get rid of belly fats naturally helpful. Thanks for stopping by!